The silver brads are from Michael's, grey twine is from the Twinery, stamped sentiment is from Verve, papers are On the Bright Side-One by My Mind's Eye, and I added some machine stitching to the borders and then distressed them with my fingernail. The large white panel is up on foam tape against the base of the card. Hi dear friend!! It has been a while since I last popped in and blogged. We are now moved into our new home. There is just so much to do but I had to take a moment to pop in some of my dear friend's blogs. Missed you Denise!! Love your card with the stitching, combo of papers and the added silver baubles. Have a great weekend! Oh my goodness! This totally rocks! Awesome CAS card! Everytime I see you use those stars.I.Need.Them. Love the silver brads you added. Will have to try and find those at my Mike's. hmmmm! What a gorgeous card Denise. As Prince would sing... Baby, You're A Star, Yes You Are! Love it! Oh Denise! I have not been getting your email alerts ... and so haven't popped by (again!!!)! I have so many lovely blog friends ... I find the email alerts the best way to keep on top of new posts ... because I visit when I get the emails. Sigh ... shame on me for not remembering you without the alerts!!! I noticed you don't have the 'subscribe by email' option on your new blog look ... so perhaps that is why!? All I can say is ... BIG APOLOGIES for being MIA!!! Oooh ... found the email subscribe button at the bottom of your page! Great CAS card! 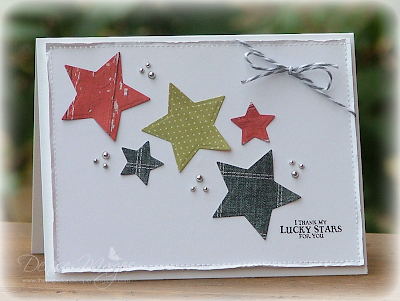 I love the paper you used on the stars and the placement of the silver brads. I love it! Simply gorgeous!